Students from Professor Grizelle De Los Reyes’ classes pose for a photo with the judges panel after delivering their presentations. Paul DeMontpellier has never been to Europe. That will change this fall after he and a group of classmates won a free round-trip plane ticket to Spain thanks to Air Europa, a Spanish-based airliner with U.S. offices in Miami and New York. DeMontpellier, a graduate student in FIU’s Global Strategic Communications’ creative track, took part in a course during the Spring 2017 semester where students from two of Professor Grizelle De Los Reyes’ classes combined their skills and knowledge to craft a full-fledged communications campaign for Air Europa. After completing a summer internship at an ad agency and graduating with a master’s degree, DeMontpellier plans to use the ticket for a two-week trip to Spain, exploring some of the country’s major cities such as Madrid and Barcelona and perhaps visiting some family members who live in neighboring France. 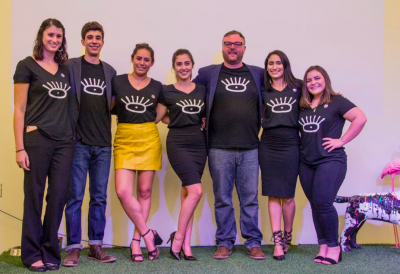 The project provided a unique opportunity for students to create strategies, tactics and creative ideas to a real client and helped FIU show its willingness to work with corporations and employers with connections to South Florida. And for Air Europa, which has had offices in Miami for the last three years, it gave the company a chance to build vital relationships within the community. After learning about Air Europa’s desire to work collaboratively with FIU, De Los Reyes connected undergraduate students from her Integrated Communications Campaigns (MMC 4410) course and graduate students from her Creative Strategy (ADV 6805) into five groups for the project. Left to right: Nicole Beckelheimer, Jorge Orta, Ornella Poumian, Elaine Cordova, Paul DeMontpellier, Alicia Loredo and Taylor Oliva won a free trip to Spain. Each student held a specific role that would mimic the actual positions at a real ad agency tasked with creating communications campaigns for clients, including an account planner, media director, art director and a copywriter. “Any time you can simulate what it would be like in an actual agency as close as possible where you have every element of a team that would create something like this, it is really beneficial,” DeMontpellier says. One of the main objectives: to connect with a new target audience, particularly millennials, in a memorable and relevant way. Over the course of the 16-week semester, the group had a briefing with a representative from Air Europa to learn about their objectives; did secondary research to learn more about the Air Europa brand and trends in the airline industry; developed, designed and conducted surveys, focus groups and interviews to gather consumer insight; and, finally, putting together a creative strategy based on their findings. 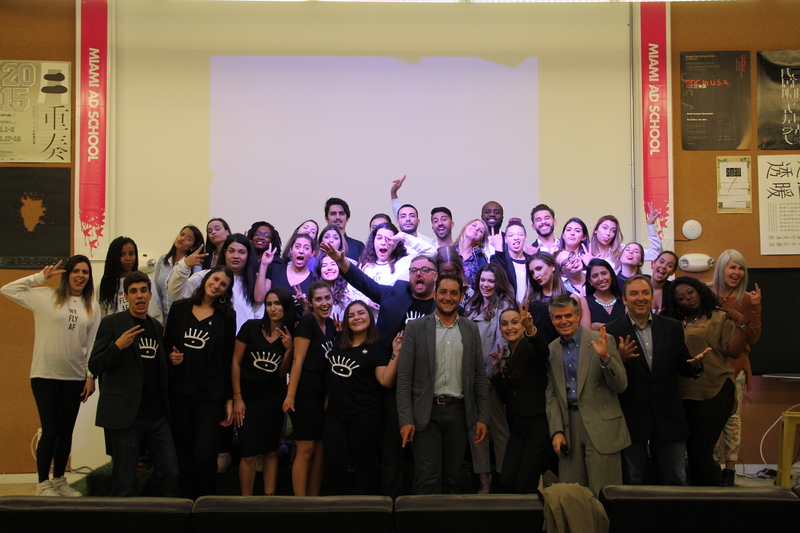 At the end of the semester, each group pitched their ideas to a panel of judges that included a representative from Air Europa, industry professionals and FIU faculty – including Executive Director of Career and Talent Development Fernando Figueredo and Department of Communication Chair Maria Elena Villar. The panel chose the winning group that evening, whose members would receive that free trip to Spain. Students created an integrated communications plan for Air Europa with creative strategies that included digital signage in airports. In the end, it was DeMontpellier and his teammates that emerged as the winning group. Their campaign included a proposal for a clever marketing strategy that spanned across multiple platforms, combining Air Europa’s benefits and offerings with its Spanish heritage. 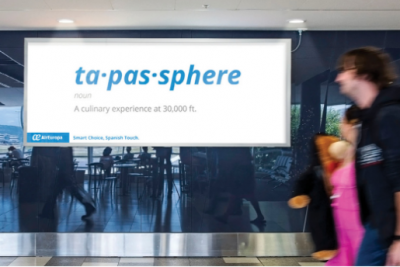 The strategy featured colorful wordplay, mixing Spanish words with airline terminology to create new terms such as “Skyesta” (a combination of sky and siesta) and “Tapasphere” (tapas and atmosphere) to play up the airline’s Spanish culture. “What we really wanted was that when people thought ‘I want to travel to Spain,’ the first thing they thought of was Air Europa,” says DeMontpellier, who was the group’s copywriter. The quality of the presentations and the ideas that came from the students impressed the panel of judges and it is not inconceivable to see Air Europa perhaps use some of the ideas presented in a real campaign.